Borobudur sunrise tour has become a hot issue in Yogyakarta. It’s no secret that many tourists both local and international would love to enjoy the breathtaking sunrise in Yogyakarta by joining this tour. If you are one of them who are interested for taking part in the trip, this following information must be good for you! 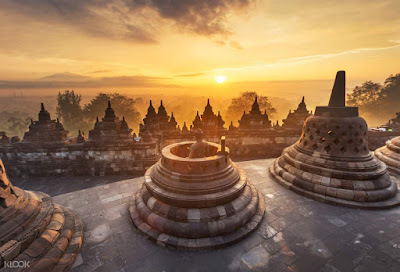 The first thing that you need to know is that there are actually some ways to enjoy sunrise around Borobudur Temple. Here, we are going to focus more on the trip via the popular Setumbu Hills. So, here we go. There is one thing to remember when you want to join this trip: you need to go early in the morning for taking part in the tour. Most people would love to rent a car or join a sharing tour for it. Whatever option you take, it’s no doubt that you will enjoy the adventure anyway. The journey will take about an hour and a half if you head out from the Yogyakarta downtown area. The Setumbu Hills itself is actually located near the Borobudur temple and it is a bit hard to get to the viewpoint by your own. That’s why for first time travelers, it is more recommended to join a sharing tour or renting a car along with the driver. If you are planning to go for sunrise, you need to make sure that you arrive on Setumbu Hills around 5.20am. You can consider coming here earlier since you will need to hike for a bit until you reach the viewpoint spot. But, don’t worry it is not a difficult trek and it is actually safe for person of any age. When it comes to the budget, the most important thing to remember is that you need to prepare for the entrance fee. The fee is USD 25 for foreigners and IDR 40000 for local tourists. If you are coming here by ojek, it is better for you to not ask about the entrance fee to the ojek driver since there are some of them who make extra money from it. If you join a sharing tour, all the accommodation might be handled by the tour provider. So, you only need to consider about the price rate of the Borobudur sunrise tour package that is offered by the provider. Well, you can expect for such lovely view of sunrise with the wonderful Borobudur Temple in the backdrop. In addition to enjoy the beautiful view of the sunrise, you can also take your time to capture your beautiful picture and bring it back as a wonderful memory. If you don’t want to be bothered by some of the things above for enjoying Borobudur sunrise tour, you shouldn’t be worry. Now, there is www.jogjabromotour.com that will be ready for you to help you get the most of your tour in Yogyakarta.